Just a quick post about a strange Word 2013 crash when I created a new document starting from one of the templates. This weekend, I did a fresh install of Office 2013. Nothing fancy, just a next-next-finish install. 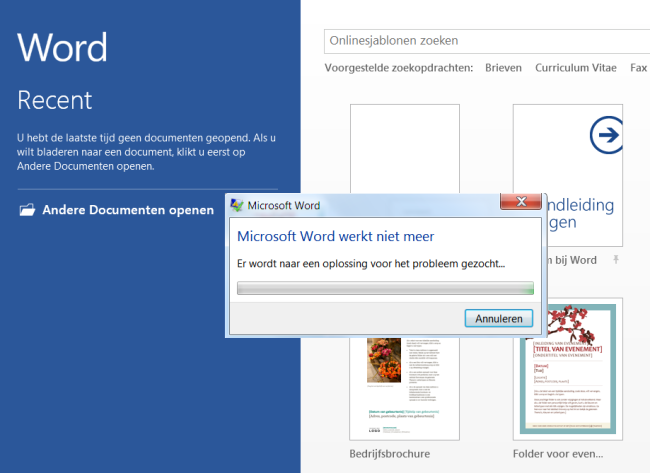 After the installation, I opened Word 2013 to see that everything is working as expected. But actually, it didn’t. This is what happened after selecting one of the provided templates. Word stopped working. 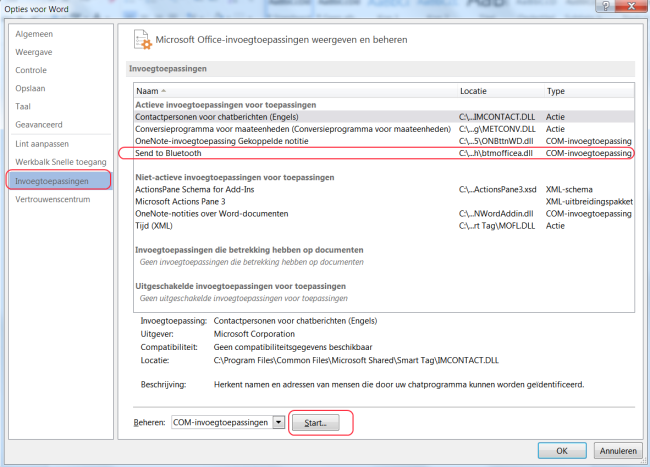 (Btw, it’s a Dutch version of Office 2013, as it was an install on my dad’s machine). After some research, I found that it was something related to the Bluetooth COM Add-in. Because that’s the only thing that appears on the Splash screen of Word: “Loading Bluetooth add-in”. To solve this problem, you can disable this COM Add-in by clicking on the ‘Options‘ link on the left side of the screen. (Just press escape when you’re on the templates screen to be able to access the options menu). There you click on ‘Add-ins‘, and select the ‘Send to Bluetooth’ Add-in. Now you can select ‘Start‘ on the bottom of the screen. You should see a new screen where can disable the ‘Send to Bluetooth’ Add-in. So uncheck the option, and click ‘OK‘. That’s it. You should now be able to start a new document using one of many provided templates. Yesterday, I was trying out some of the new apps that became available after the official Windows 8 launch last week. The 2 apps that I was looking for was Lync and Skype. So, off to the Windows 8 store, a small search and a few seconds later I had the apps. App Microsoft.LyncMX_8wekyb3d8bbwe!Microsoft.LyncMX did not launch within its allotted time. Windows 8 N editions have been designed to give you most of the features of Windows 8—with the addition of choice. 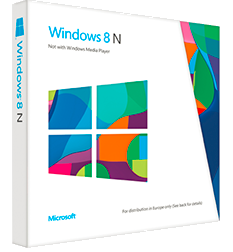 There are three Windows 8 N editions: Windows 8 N, Windows 8 Pro N, and Windows 8 Pro Pack N. The N editions of Windows 8 allow you to choose your own media player and software required to manage and play CDs, DVDs, and other digital media files. If you choose to use Windows Media Player 12, downloading it, along with related software, is free. Windows 8 N editions are available for customers who live in countries that are part of the European Economic Area, Croatia, and Switzerland. For one reason or another, the 2 apps that I tried do need some media features that are not there with Windows 8 N. So all I had to do was download the required media things. Microsoft actually provides a ‘Media Features Pack For Windows 8 N‘. You can download the installer here. After installing this package (and a reboot!) my apps were just running fine. Have fun with Windows 8! Thanks for reading. Note: I don’t have any experience with Windows 8 development, but perhaps, developers, could you please add a check on the App launch to find out if the required components are available on the system? Would be awesome!